I recently had the pleasure of reading Difficulties in Mental Prayer: A New Edition of a Classic Guide to Meditaion by M. Eugene Boylan, O.C.R. Ave Maria Press has issued a new edition of this work which was first published in 1943. Obviously the world has changed a great deal in nearly seventy years. The Church has changed a lot as well, as has the way we speak about prayer. 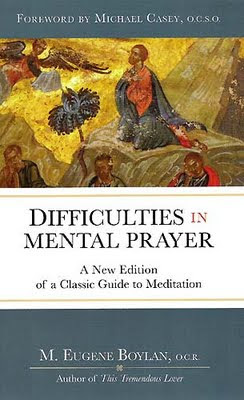 Difficulties in Mental Prayer is of great value to anyone seeking to deepen his or her relationship with God. At one time or other, we all struggle in our prayer lives. Fr. Boylan offers encouragement and concrete suggestions to help us strengthen our prayer and commitment to God. This entry was posted on Sunday, July 24th, 2011 at 6:49 pm	and is filed under Book Reviews, Prayer. You can follow any responses to this entry through the RSS 2.0 feed. You can leave a response, or trackback from your own site.